Ferrari cars are known for their class and finesse…and of course a lot of money. Is it the case with their maiden entry product in the portable audio market. The recently launched Cavallino G150 in-ear earphones are a testament to their aesthetics and price.These earphones are sure as hell beautiful enough to hold in your hand for everyone to see. 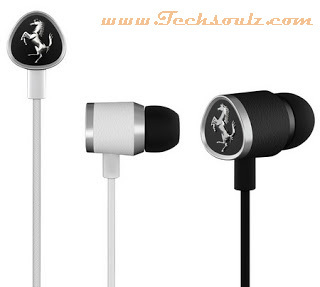 The earphones are a triangular curve with the Ferrari Cavallino stamp on their outermost side. They do seem to possess larger earpieces than conventional in-ears but that leather outer skin gives it a very soft feel. The wires are made of woven fabric that seems to be the norm these days for high-end earphones primarily because that keeps them tangle-free. Going down the wire is a single button remote that might add a bit of weight to the already heavy earphones. Supplied in the carrying case are also variable sized earplugs that are more than what you might find in most of the competitors’ cases. The G150s come in black and white colour. The G150s use a 10mm TFAT.The light weight aluminium casing within which its earpieces house the driver is deep enough to allow for those lower-end frequencies to propagate before using your ear-canal as an extension of their shells. The remote on their wire can be used for Android, Windows or Blackberry devices. It is a single button that can be used for transport functions. A microphone is also built-in so you can use it as a hands-free set. If you own an iPod or any other iOS device, a model called the G150i is also available that has a three-button remote: the same single button for the transport and two others for volume control. It was nice to get the options for earplugs but at this price-range Ferrari should have offered some adapters and accessories as well. 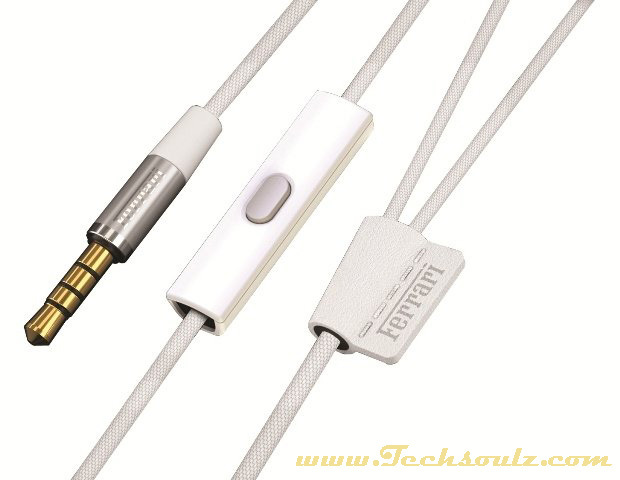 The tangle-free wires help a great deal in not having to worry about bunching the earphones up in your pocket. The remote on them can do wonders for your smartphone music experience, especially if you are someone that rides a motorbike and can’t possibly reach the phone every time you want to switch songs. Most people won’t need anything more than three of the earplug sizes, so that will help keep them snug in your ears. But, that said, because of the rather large earpieces themselves, they do tend to pinch your ears – this depends entirely on your ear size. I can never get the small earplugs to stay in my ear and neither can I survive the pain which comes with using the large sized ones. It is important to note that the size of the earplug makes a big difference to the frequency range. The smaller ones reduce the bass while the larger ones extend them. With the medium sized ones in G150, I got a good mix of both. Initially, when I put them in my ears, they hurt my earwalls because they were way larger than my own earphones that I’ve gotten used to. But as I wore them for a little longer, my ears did get used to them although the pinching was still around which dampened the experience. I am always a promoter for in-ears to be as small as possible because they rely so heavily on a person’s ear shape. So the smaller they are, the better their chances of gaining acceptance with the masses. The sound is very lifelike by this I mean that they don’t share the same closed-up sound that most other in-ears have. No matter what the music is, they open it up in your ears to a level where you can mistake the in-ears for bookshelf speakers. With a sensitivity of 97dB, they don’t jump into your ears like highly enthusiastic, ear damaging earphones and neither are they so laid back that you need to crank your iPod to maximum. Be it the quiet, contemplative OST of ‘The Sessions’ or the party OST of ‘Project X’, the G150s make everything sound interesting enough to keep you glued to it.